Today my coworker and I embarked on a delicious Grüner Veltliner from Austria to lift our spirits and distract us from the miserable, rainy afternoon outside. 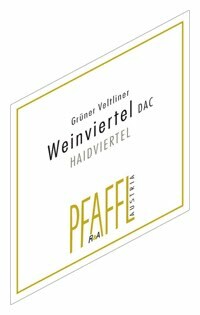 We decided upon the Pfaffl Grüner Veltliner Wienviertel DAC Haidviertel. Our style preferences differ from one another, he prefers a much lighter, fruity style and the tanginess of Grüner is what really gets me. On that note, this Grüner was made for me. A heavier weight than some Grüner’s in the mouth, there are intricate flavors of minerals, light floral and green apple as well as unripe pear and even a hint of orange. The characteristic white pepper is present giving the wine an extra, spicy bite at the finish. Considering I was already having Halibut, steamed asparagus and brown rice for dinner, I figure it was only fair I’m the one who gets to take this wine home as a Monday evening treat. I trust my roommate will be pleased as well. ← Blaufränkisch like you’ve never seen it!